This recipe came to me while I was driving home from work one day. I had been wanting to do a cake of sorts, but wasn't exactly sure how to go about it. It wasn't from research or testing out recipes that I stumbled upon this. I was actually scrolling through my Instagram feed and saw a couple cakes that led me to believe KetoConnect was destined to make the perfect keto cake. And, we did it. Our Protein Cakes are less than one net carb and taste like the real, damn deal. Watch me make them below! The secret to this ultra low carb cake is the protein powder we use, and we use Is﻿﻿﻿opure Protein Powder (cookies and cream is our favorite). Not only is it zero carbs, but there are a ton of great flavors and it is really high quality (in our opinion!). The downside is it is a bit pricey, but given the pros we think it's absolutely worth it! One thing to note is that if you do use another protein powder it will alter the nutrition of the cakes. When you're focused on fat as much as us keto-ers are it can be easy to neglect the protein intake. We even go as far as making fat bombs! Well, it's time for protein desserts to take the spotlight for once, thus we created these cake bites of protein heaven! We've created a chocolate protein cake for our chocolate lovers and a vanilla protein cake for our vanilla lovers! While Matt is more of a chocolate lover - making chocolate icing was his idea - I prefer the vanilla. But, you're better off having one of each! A tip to making the frosting extra creamy and smooth is to ensure the butter is room temperature when you mix it. Not only will cold butter be harder to mix, but it will take longer and have a slightly different texture. 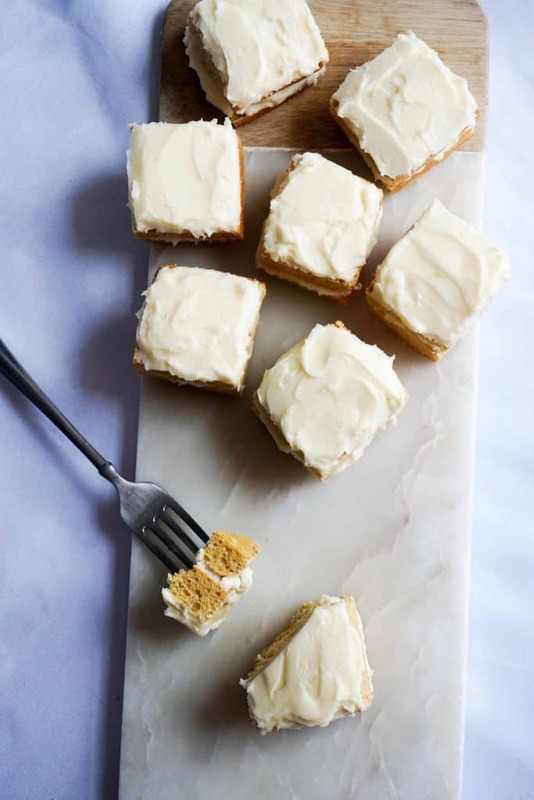 However, if you want to omit the icing altogether I'd suggest adding a couple extra drops of Stevia to the cake batter for a sweeter cake, more like a birthday cake! 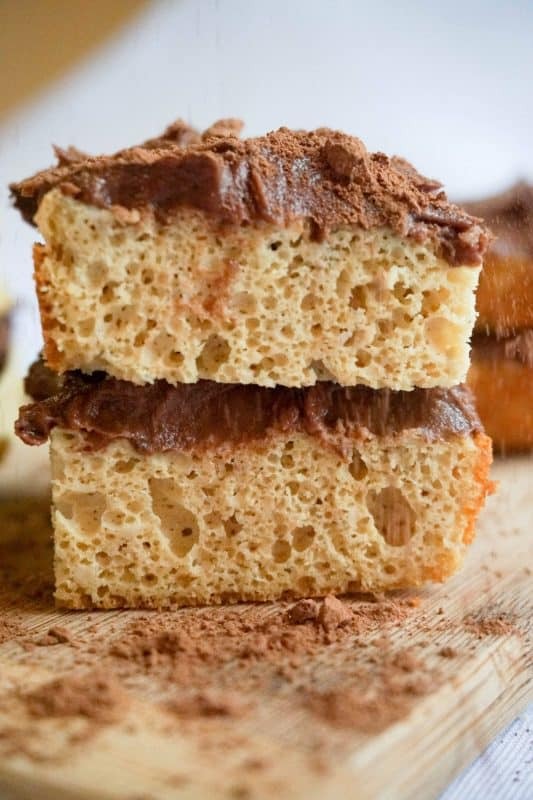 If you're a fan of using protein powder in your recipes like we are, than we highly recommend trying our Keto M﻿acro Cakes or Matt's Nutritious Mug Cake! Both recipes sport Isopure protein powder and are quick to make. When dessert is as healthy and keto-friendly as these Protein Cakes, it's hard to say no. Don't forget that whatever protein powder you use will not only dictate a change in nutrition, but will also dictate the flavor of the cakes! This protein cake recipe will be your new go to dessert recipe. Fat bombs move aside! 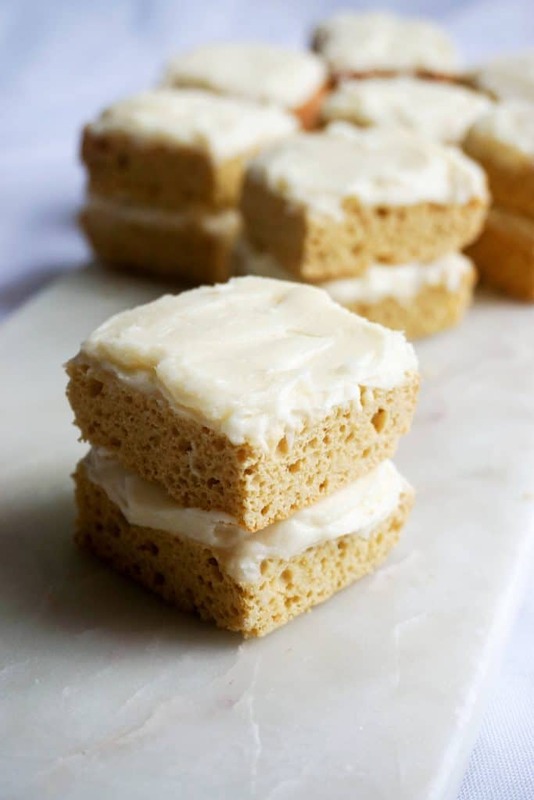 Recipe can be quickly added to MyFitne﻿﻿ssPa﻿﻿l - Search "KetoConnect - Protein Cake"
Combine room temperature butter, cream cheese and sour cream in a bowl. Add eggs, vanilla extract, liquid stevia and combine well. Gently fold dry ingredients into wet ingredients. Make sure not to over mix! Lumps are okay. Pour mixture into a loaf pan and bake at 325 for 30 minutes. Allow to cool and then cut in half length wise. Cut two halves into 4 equal pieces and then 4 more equal pieces to resemble 8 mini cakes as seen above! Enjoy!